To celebrate their first anniversary, Modern Rocks Gallery is bringing you a very special showcase of the work of photographer Stephen Wright, the man responsible the famous image of The Smiths outside The Salford Lads Club in Manchester for the cover of The Queen Is Dead. The evening will feature an unveiling of Wright's images as well as specialty cocktails. Wright's work of signed and numbered limited edition prints are not available anywhere else in the United States. 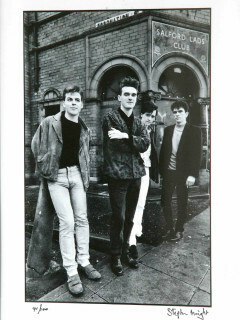 The exhibition The Smiths & Friends: Iconic Musicians by Stephen Wright will be on display from April 18 through May 23.